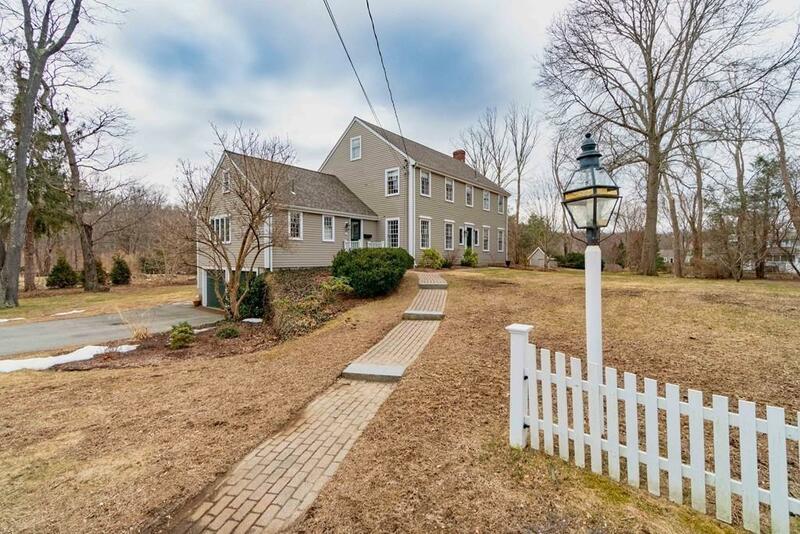 Beautiful 5-bed Colonial set back off the main road, on almost an acre of land! An incredibly private & serene property overlooking conservation land w/ trails to Weir River Farm (barnyard events & farm-to-table dinners!). This property abuts the wonderful Eastgate Lane neighborhood, & is a stone's throw to East Elementary & Commuter Train to Boston! This "Steve Baker" built home is pristine, & brimming with charm. 1st floor features a spacious, sunlit family room w/ a gorgeous fireplace that opens to the lovely chef's kitchen. Walk out from the kitchen to a large deck perfect for alfresco dining! A 2nd front-to-back living room, formal dining room, 1/2 bath, and 2 separate office nooks complete the 1st floor. The 2nd floor features a master suite w/ updated bath & custom walk-in closet, 2 additional bedrooms (one w/ en-suite bath) and a 3rd hallway bathroom. 2 additional bedrooms up on the 3rd fl.The finished lower level offers great bonus space, plus a mud area off the 2-car garage!